A xerophyte (from Greek ξηρός xeros dry, φυτόν phuton plant) is a species of plant that has adaptations to survive in an environment with little liquid water, such as a desert or an ice- or snow-covered region in the Alps or the Arctic. Popular examples of xerophytes are cacti, pineapple and some Gymnosperm plants. The structural features ( morphology) and fundamental chemical processes ( physiology) of xerophytes are variously adapted to conserve water, also common to store large quantities of water, during dry periods. Other species are able to survive long periods of extreme dryness or desiccation of their tissues, during which their metabolic activity may effectively shut down. Plants with such morphological and physiological adaptations are xeromorphic. Xerophytes such as cacti are capable of withstanding extended periods of dry conditions as they have deep-spreading roots and capacity to store water. The leaves are waxy and thorny that prevents loss of water and moisture. Even their fleshy stems can store water. The structural adaptations of these two resurrection plants are very similar. They can be found on the grounds of Bulgaria and Greece. Plants absorb water from the soil, which then evaporates from their shoots and leaves; this process is known as transpiration. In dry environments, a typical mesophytic plant would evaporate water faster than the rate of water uptake from the soil, leading to wilting and even death. Xerophytic plants exhibit a diversity of specialized adaptations to survive in such water-limiting conditions. They may use water from their own storage, allocate water specifically to sites of new tissue growth, or lose less water to the atmosphere and so channel a greater proportion of water from the soil to photosynthesis and growth. Different plant species possess different qualities and mechanisms to manage water supply, enabling them to survive. Cacti and other succulents are commonly found in deserts, where there is little rainfall. Other xerophytes, such as certain bromeliads, can survive through both extremely wet and extremely dry periods and can be found in seasonally-moist habitats such as tropical forests, exploiting niches where water supplies are too intermittent for mesophytic plants to survive. Likewise, chaparral plants are adapted to Mediterranean climates, which have wet winters and dry summers. There are many factors which affect water availability, which is the major limiting factor of seed germination, seedling survival, and plant growth. These factors include infrequent raining, intense sunlight and very warm weather leading to faster water evaporation. An extreme environmental pH and high salt content of water also disrupt plants' water uptake. Succulent plants store water in their stems or leaves. These include plants from the Cactaceae family, which have round stems and can store a lot of water. The leaves are often vestigial, as in the case of cacti, wherein the leaves are reduced to spines, or they do not have leaves at all. These include the C4 perennial woody plant, Haloxylon ammodendron which is a native of northwest China. Non-succulent perennials successfully endure long and continuous shortage of water in the soil. These are hence called 'true xerophytes' or euxerophytes. Water deficiency usually reaches 60–70% of their fresh weight, as a result of which the growth process of the whole plant is hindered during cell elongation. The plants which survive drought are, understandably, small and weak. Ephemerals are the 'drought escaping' kind, and not true xerophytes. They do not really endure drought, only escape it. With the onset of rainfall, the plant seeds germinate, quickly grow to maturity, flower, and set seed, i.e., the entire life cycle is completed before the soil dries out again. 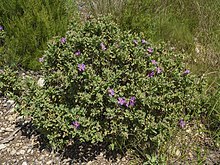 Most of these plants are small, roundish, dense shrubs represented by species of Papilionaceae, some inconspicuous Compositae, a few Zygophyllaceae and some grasses. Water is stored in the bulbs of some plants, or at below ground level. They may be dormant during drought conditions and are, therefore, known as drought evaders. In brief, the rate of transpiration is governed by the number of stomata, stomatal aperture i.e. the size of the stoma opening, leaf area (allowing for more stomata), temperature differential, the relative humidity, the presence of wind or air movement, the light intensity, and the presence of a waxy cuticle. It is important to note, that whilst it is vital to keep stomata closed, they have to be opened for gaseous exchange in respiration and photosynthesis. The cactus Cereus peruvianus looks superficially very similar to Euphorbia virosa due to convergent evolution. Xerophytic plants may have similar shapes, forms, and structures and look very similar, even if the plants are not very closely related, through a process called convergent evolution. For example, some species of cacti (members of the family Cactaceae), which evolved only in the Americas, may appear similar to Euphorbias, which are distributed worldwide. An unrelated species of caudiciforms plants with swollen bases that are used to store water, may also display some similarities. Xerophytic plants can have less overall surface area than other plants, so reducing the area that is exposed to the air and reducing water loss by transpiration and evaporation. They can also have smaller leaves or fewer branches than other plants. An example of leaf surface reduction are the spines of a cactus, while the effects of compaction and reduction of branching can be seen in the barrel cacti. Other xerophytes may have their leaves compacted at the base, as in a basal rosette, which may be smaller than the plant's flower. This adaptation is exhibited by some Agave and Eriogonum species, which can be found growing near Death Valley. Some xerophytes have tiny hairs on their surfaces to provide a wind break and reduce air flow, thereby reducing the rate of evaporation. When a plant surface is covered with tiny hairs, it is called tomentose. Stomata are located in these hairs or in pits to reduce their exposure to wind. This enables them to maintain a humid environment around them. In a still, windless environment, the areas under the leaves or spines where transpiration takes place form a small localised environment that is more saturated with water vapour than normal. If this concentration of water vapour is maintained, the external water vapour potential gradient near the stomata is reduced, thus, reducing transpiration. In a windier situation, this localisation is blown away and so the external water vapour gradient remains low, which makes the loss of water vapour from plant stomata easier. Spines and hairs trap a layer of moisture and slows air movement over tissues. Many xerophytic species have thick cuticles. Just like human skin, a plant's cuticles are the first line of defense for its aerial parts. As mentioned above, the cuticle contains wax for protection against biotic and abiotic factors. The ultrastructure of the cuticles varies in different species. Some examples are Antizoma miersiana, Hermannia disermifolia and Galenia africana which are xerophytes from the same region in Namaqualand, but have different cuticle ultrastructures. A. miersiana has thick cuticle as expected to be found on xerophytes, but H. disermifolia and G. africana have thin cuticles. Since resources are scarce in arid regions, there is selection for plants having thin and efficient cuticles to limit the nutritional and energy costs for the cuticle construction. There are many changes that happen on the molecular level when a plant experiences stress. When in heat shock, for example, their protein molecule structures become unstable, unfold, or reconfigure to become less efficient. Membrane stability will decrease in plastids, which is why photosynthesis is the first process to be affected by heat stress. Despite the many stresses, xerophytes have the ability to survive and thrive in drought conditions due to their physiological and biochemical specialties. Dudleya pulverulenta is called 'chalk lettuce' for its obvious structures. This xerophyte has fleshy succulent leaves and is coated with chalky wax. Some plants can store water in their root structures, trunk structures, stems, and leaves. Water storage in swollen parts of the plant is known as succulence. A swollen trunk or root at the ground level of a plant is called a caudex and plants with swollen bases are called caudiciforms. Plants may secrete resins and waxes ( epicuticular wax) on their surfaces, which reduce transpiration. Examples are the heavily-scented and flammable resins ( volatile organic compounds) of some chaparral plants, such as Malosma laurina, or the chalky wax of Dudleya pulverulenta. In regions continuously exposed to sunlight, UV rays can cause biochemical damage to plants, and eventually lead to DNA mutations and damages in the long run. When one of the main molecules involved in photosynthesis, photosystem II (PSII) is damaged by UV rays, it induces responses in the plant, leading to the synthesis of protectant molecules such as flavonoids and more wax. Flavonoids are UV-absorbing and act like sunscreen for the plant. Line 1 represents typical mesophytic plants and line 2 represents xerophytes. The stomata of xerophytes are nocturnal and have inverted stomatal rhythm. As compared to other plants, xerophytes have an inverted stomatal rhythm. During the day and especially during mid-day when the sun is at its peak, most stomata of xerophytes are close. Not only do more stomata open at night in the presence of mist or dew, the size of stomatal opening or aperture is larger at night compared to during the day. This phenomenon was observed in xeromorphic species of Cactaceae, Crassulaceae, and Liliaceae. Light stress can be tolerated by dissipating excess energy as heat through the xanthophyll cycle. Violaxanthin and zeaxanthin are carotenoid molecules within the chloroplasts called xanthophylls. Under normal conditions, violaxanthin channels light to photosynthesis. However, high light levels promote the reversible conversion of violaxanthin to zeaxanthin. These two molecules are photo-protective molecules. Plants utilising the CAM photosynthetic pathway are generally small and non-woody. Stomata closure not only restricts the movement of water out of the plant, another consequence of the phenomenon is that carbon dioxide influx or intake into the plant is also reduced. As photosynthesis requires carbon dioxide as a substrate to produce sugar for growth, it is vital that the plant has a very efficient photosynthesis system which maximises the utilisation of the little carbon dioxide the plant gets. A Rose of Jericho plant in dormancy re-flourishes when its roots are placed in a bowl of water. A Geoffroea decorticans tree is both a winter and drought deciduous tree. During dry times, resurrection plants look dead, but are actually alive. Some xerophytic plants may stop growing and go dormant, or change the allocation of the products of photosynthesis from growing new leaves to the roots. These plants evolved to be able to coordinately switch off their photosynthetic mechanism without destroying the molecules involved in photosynthesis. When water is available again, these plants would "resurrect from the dead" and resume photosynthesis, even after they had lost more than 80% of their water content. A study has found that the sugar levels in resurrection plants increase when subjected to desiccation. This may be associated with how they survive without sugar production via photosynthesis for a relatively long duration. Some examples of resurrection plants include the Anastatica hierochuntica plant or more commonly known as the Rose of Jericho, as well as one of the most robust plant species in East Africa, the Craterostigma pumilum. Seeds may be modified to require an excessive amount of water before germinating, so as to ensure a sufficient water supply for the seedling's survival. An example of this is the California poppy, whose seeds lie dormant during drought and then germinate, grow, flower, and form seeds within four weeks of rainfall. If the water supply is not enough despite the employment of other water-saving strategies, the leaves will start to collapse and wilt due to water evaporation still exceeding water supply. Leaf loss ( abscission) will be activated in more severe stress conditions. Drought deciduous plants may drop their leaves in times of dryness. The leaf litter on the ground around a plant can provide an evaporative barrier to prevent water loss. [ citation needed] A plant’s root mass itself may also hold organic material that retains water, as in the case of the arrowweed ( Pluchea sericea). Agave Americana is a versatile xerophyte. All parts of the plant can be used either for aesthetics, for consumption, or in traditional medicine. A more well-known xerophyte is the succulent plant Agave americana. It is cultivated as an ornamental plant popular across the globe. Agave nectar is garnered from the plant and is consumed as a substitute for sugar or honey. 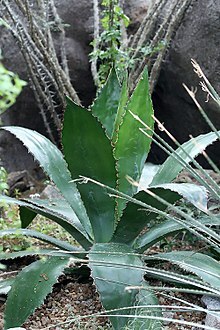 In Mexico, the plant's sap is usually fermented to produce an alcoholic beverage. "Beautiful but deadly". 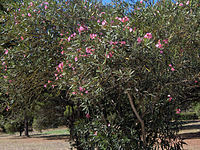 The Nerium oleander plant on the left was taken during Portugal's Autumn, while the one on the right was taken during summer in Italy. ^ Gechev, Tsanko S.; Hille, Jacques; Woerdenbag, Herman J.; Benina, Maria; Mehterov, Nikolay; Toneva, Valentina; Fernie, Alisdair R.; Mueller-Roeber, Bernd (2014-11-01). "Natural products from resurrection plants: Potential for medical applications". Biotechnology Advances. 32 (6): 1091–1101. doi: 10.1016/j.biotechadv.2014.03.005. ISSN 0734-9750. PMID 24681091. ^ Liu, Hua; Wang, Qiuqing; Yu, Mengmeng; Zhang, Yanyan; Wu, Yingbao; Zhang, Hongxia (2008). "Transgenic salt-tolerant sugar beet (Beta vulgaris L.) constitutively expressing an Arabidopsis thaliana vacuolar Na/H antiporter gene, AtNHX3, accumulates more soluble sugar but less salt in storage roots". Plant, Cell & Environment. 31 (9): 1325–1334. doi: 10.1111/j.1365-3040.2008.01838.x. ISSN 1365-3040. PMID 18518917. ^ Wu, Guo-Qiang; Wang, Qian; Bao, Ai-Ke; Wang, Suo-Min (1 March 2011). "Amiloride Reduces Sodium Transport and Accumulation in the Succulent Xerophyte Zygophyllum xanthoxylum Under Salt Conditions". Biological Trace Element Research. 139 (3): 356–367. doi: 10.1007/s12011-010-8662-9. ISSN 0163-4984. PMID 20352373. ^ McNair, J.B. "Hydrophytes, xerophytes and halophytes and the production of alkaloids, cyanogenetic and organic sulphur compounds". Journal of Natural Products. 6: 1–17. ^ a b c d Zeng, Yan Jun; Wang, Yan Rong; Zhang, Ju Ming (April 2010). "Is reduced seed germination due to water limitation a special survival strategy used by xerophytes in arid dunes?". Journal of Arid Environments. 74 (4): 508–511. doi: 10.1016/j.jaridenv.2009.09.013. ^ "3.1.4 - Turgor loss, cytorrhysis, and plasmolysis | Plants in Action". plantsinaction.science.uq.edu.au. Retrieved 2018-03-21. ^ Ibañez, A.N. ; Passera, C.B. (February 1997). "Factors affecting the germination of albaida (Anthyllis cytisoidesL. ), a forage legume of the Mediterranean coast". Journal of Arid Environments. 35 (2): 225–231. doi: 10.1006/jare.1995.0142. ^ Mulroy, Thomas W. (1979). "Spectral properties of heavily glaucous and non-glaucous leaves of a succulent rosette-plant". Oecologia. 38 (3): 349–357. doi: 10.1007/BF00345193. PMID 28309493. ^ Jordaan, A.; Kruger, H. (February 1998). "Notes on the cuticular ultrastructure of six xerophytes from southern Africa". South African Journal of Botany. 64 (1): 82–85. doi: 10.1016/S0254-6299(15)30829-2. ^ a b c d e f g h Turnbull, C. (2017) LS1-OB.34 - Plant stress. ^ a b c d GINDEL, I. (April 1970). "THE NOCTURNAL BEHAVIOUR OF XEROPHYTES GROWN UNDER ARID CONDITIONS". New Phytologist. 69 (2): 399–404. doi: 10.1111/j.1469-8137.1970.tb02438.x. ^ McNeil, Paul L.; Steinhardt, Richard A. (7 April 1997). "Loss, Restoration, and Maintenance of Plasma Membrane Integrity". The Journal of Cell Biology. 137 (1): 1–4. ISSN 0021-9525. PMC 2139853. PMID 9105031. ^ Atia, Abdallah; Rabhi, Mokded; Debez, Ahmed; Abdelly, Chedly; Gouia, Houda; Haouari, ChirazChaffei; Smaoui, Abderrazak (1 December 2014). "Ecophysiological aspects in 105 plants species of saline and arid environments in Tunisia". Journal of Arid Land. 6 (6): 762–770. doi: 10.1007/s40333-014-0028-2. ISSN 1674-6767. ^ "Plant Adaptations". University of New Mexico. Archived from the original on January 4, 2015. Retrieved December 2, 2014. ^ Schwab, K. B.; Schreiber, U.; Heber, U. (1989-02-01). "Response of photosynthesis and respiration of resurrection plants to desiccation and rehydration". Planta. 177 (2): 217–227. doi: 10.1007/bf00392810. ISSN 0032-0935. PMID 24212344. ^ Zia, Ahmad; Walker, Berkley J.; Oung, Hui Min Olivia; Charuvi, Dana; Jahns, Peter; Cousins, Asaph B.; Farrant, Jill M.; Reich, Ziv; Kirchhoff, Helmut (September 2016). "Protection of the photosynthetic apparatus against dehydration stress in the resurrection plant". The Plant Journal. 87 (6): 664–680. doi: 10.1111/tpj.13227. PMID 27258321. ^ "Craterostigma pumilum - Alpine Garden Society - Plant Encyclopaedia". encyclopaedia.alpinegardensociety.net. ^ Toderich, K. N.; Shuyskaya, E. V.; Rajabov, T. F.; Ismail, Shoaib; Shaumarov, M.; Yoshiko, Kawabata; Li, E. V. (2013). Combating Desertification in Asia, Africa and the Middle East. Springer, Dordrecht. pp. 249–278. doi: 10.1007/978-94-007-6652-5_13. ISBN 9789400766518. ^ Belaeva, Tatiana Nikolaevna; Butenkova, Alina Nikolaevna; Astafurova, Tatiana Petrovna (2014). "Phlox sibirica L. in South Siberia". Biosciences Biotechnology Research Asia. 11 (Spl Edition Nov. 14): 371–376. doi: 10.13005/bbra/1488. ^ Prijambada, Erlina; Sudikno, Antariksa; Murti Nugroho, Agung; Leksono, Amin (2016-03-01). "Sansevieria trifasciatas, xerophyte as indoor humidity absorber of small type residences 1". Ecology, Environment and Conservation. 22. ^ John, Mwonjoria; Aliyu, Umar; Kevin, Juma; Titus, Kahiga; Piero, Ngugi; David, Mburu; Alphonse, Wanyonyi; Charles, Githinji; Joseph, Ngeranwa (25 August 2016). 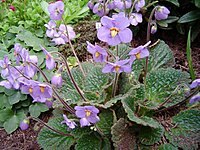 "Anti-inflammatory activity of craterostigma pumilum (hochst) is associated with hyperalgesia". International Journal of Pharmacology and Toxicology. 4 (2): 169. doi: 10.14419/ijpt.v4i2.6497. ^ Dell’Acqua, G.; Schweikert, K. (April 2012). "Skin benefits of a myconoside-rich extract from resurrection plant Haberlea rhodopensis". International Journal of Cosmetic Science. 34 (2): 132–139. doi: 10.1111/j.1468-2494.2011.00692.x. PMID 22023081. ^ Gechev, Tsanko S.; Hille, Jacques; Woerdenbag, Herman J.; Benina, Maria; Mehterov, Nikolay; Toneva, Valentina; Fernie, Alisdair R.; Mueller-Roeber, Bernd (1 November 2014). "Natural products from resurrection plants: Potential for medical applications". Biotechnology Advances. 32 (6): 1091–1101. doi: 10.1016/j.biotechadv.2014.03.005. ISSN 0734-9750. PMID 24681091. D. J. Taylor; N. P. O. Green; G. W. Stout (2001). Biological Science 1 & 2 (Third ed.). Cambridge University Press. ISBN 978-0-521-56178-5. L. Taiz; E. Zeiger; I. M. Møller; A. Murphy (2015). Plant Physiology and Development (Sixth ed.). Sinauer Associates Publishers. ISBN 978-1-60535-255-8. Wikimedia Commons has media related to Xerophytes.